The Insolar team has been hard at work to implement its blockchain platform which will foster distributed interconnected business networks. Since the platform’s principal focus is enterprise clients, it was of great importance that the platform was able to overcome the hindrances that have thus far prevented the technology’s widespread adoption for business. As such the platform will be fully enterprise ready at the tech release of the Insolar Enterprise Platform version 1.0. Let’s go through the roadmap for 2019. Insolar successfully launched its Testnet on January 22, 2019. The aim of the testnet was to affirm the hypothesis of a blockchain platform that is able to handle over 10,000 transactions per second. This milestone was reached on the testnet launch date. As one of the base requirements for enterprise integration, adequate transactional speed is a great foundation for the platform to build on, with the Insolar team managing to achieve this speed on a network of 20 nodes. This is something that few other platforms have been able to do, which highlights the difficulty of the task that the team set themselves. For monitoring purposes, the testnet was launched on nodes controlled solely by the Insolar development team. This enabled testing for different scenarios in a controlled environment. As such, participation in the Testnet was only possible as an observer, using the Insolar Block Explorer. Read how aspects of the platform work in simply explained articles in our blog. The tech paper was well-received by the community, blockchain academics and engineers, with the document currently undergoing further review by experts from around the world. The next version of the Insolar testnet is planned for release on March 4, 2019. Building on the successes of Testnet 1.0 and correcting issues discovered throughout the period from launch onwards, Testnet 1.1 will allow external participants to deploy their own node to the network. The number of parties will be limited, with strict CPU requirements. 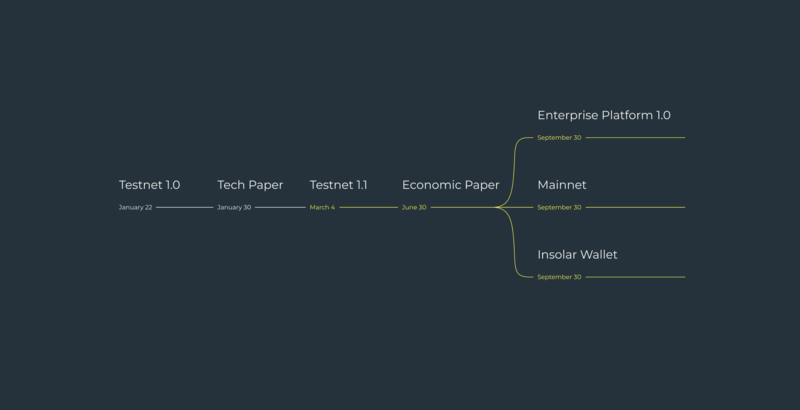 September 30, 2019 has been set as the date to release Enterprise Platform 1.0 package and the launch of the Insolar Mainnet (see description below) based on it. On this date, in addition to the open source code of Insolar, the deployment packages will be released to ease installations of the Insolar platform for the business community. This code will be fully enterprise-ready and useable to create working Proof-of-Concepts (PoCs). We are focussed on perfecting the tech before release to make it fully ready for implementation and understand that this will take some time. Meanwhile, Insolar is in the process of concluding partnerships and other contracts with Fortune 500 companies interested in integrating blockchain into their transaction systems. From now until September 30, 2019 the focus will be on making the blockchain platform enterprise-ready, with all necessary security audits and testing fully complete. The Insolar Mainnet is also set for launch on September 30, 2019 and will be able to host multiple products. The Insolar native coin will be a payment method for computation resources in the Insolar Mainnet. The Mainnet will initially be deployed on Insolar’s nodes with external nodes being included as part of the network once security has been assured. The native Insolar Wallet will be released together with the Insolar Mainnet. The current INS token holders will be able to convert their tokens from ERC-20 on the Ethereum network to native coins on the Insolar blockchain platform. These coins can then be used as part of the platform’s economy, as will be detailed in the Economic Paper. Much work lies ahead and we are proud to build on our previous successes from the beginning of the year. Check our Github and leave feedback on the code. Insolar is an open-source enterprise-grade blockchain platform to enable seamless interactions between companies and new growth opportunities powered by distributed trust.